Tapering for a race is really difficult for many runners. I know that there are some elite athletes who don’t really taper at all, although, they may take the two days before a race off. An important, possibly critical, difference between elite runners (many not all) and us not so elite runners is we all work typically full-time jobs. This means we don’t have the same opportunity to recover between our runs during training and thus we reach race day more depleted making tapering more important for the average runner. I’ve tried both three week tapers and two week tapers. I didn’t find any difference between the two. Again, that’s me. Other people may be different. 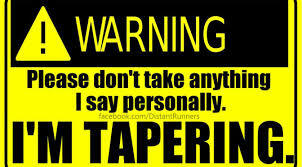 Tapering is– as many aspects of running are– very runner dependent. The professional research based recommendation is three to four weeks. This is because a taper is giving your body the time and rest needed to take all the training you’ve been doing and lock it into place in your various bodily systems. Training causes minor tears to muscles. The muscle need a chance to rebound and repair. Immune system needs time to get rid of any inflammation and repair cells. Hormone profile rebounds which takes some time especially cortisol and testosterone. Both of these become depleted during your training. Red blood cells become consistently damaged when you’re running high miles, so your having to manage that while training. The taper allows those to be repaired and to increase. This is important for oxygen transportation to muscles. Metabolic wise, rest allows you to store more glycogen in your muscles and liver. Running 100 miles is a mental as well as physical challenge. We also tend to be a bit sleep deprived which has both physical an mental components impacting our performance. It improves your vigor and mood. Many ultrarunners have some level of dehydration pretty much all the time. The taper gives you time to balance your hydration. In addition to sleep and reducing your running, nutrition is a major part of recovery. Eat healthy whole foods, which will give you what you need and reduce the chance of gaining weight close to the race once your body is using less calories to rebuild. Regardless of whether you run by time or miles, you should reduce your running by 20% each week beginning three weeks from race. You on’t need to reduce the intensity, but you shouldn’t increase it. You can maintain the number of runs per week. It’s very important that you keep in mind you are going to feel better as your body rests and recovers (the point of the taper), but you shouldn’t increase your efforts. You’ll need to use pace rather than perceived effort during your runs. You’re not going to lose any fitness by giving yourself the three weeks to rest and repair.